Born: November 19, 1855 in Falmouth Ma. Died: August 7, 1936 in Bourne Ma. at 81 yrs, 8 mos, 18 d.
1. Elsie Martha Fuller Landers; (October 19, 1889 – April 2, 1919); Married Harrie Bion Landers (1890 – 1975) (Bion Andrew Landers & Carrie Hennes) in Wilsall Mt. on February 14, 1915; Harrie Bion married (2) Mabel Moyle Lounsbery (1898 – 1968) (Solomon Moyle & Hadesseh Bickey) in Harlowton Mt. on April 3, 1926; Mabel married (1) Alonzo William Lounsbery (1893 – ?) (Andrew J. Lounsbery & Ida Kennison) in Butte Mt. on October 11, 1919; Elsie died at 29 yrs, 5 mos, 14 d. & is buried in Cataumet Cemetery with her parents; Harry Bion & Mabel are buried in Mountain View Cemetery in Livingston Mt..
2. 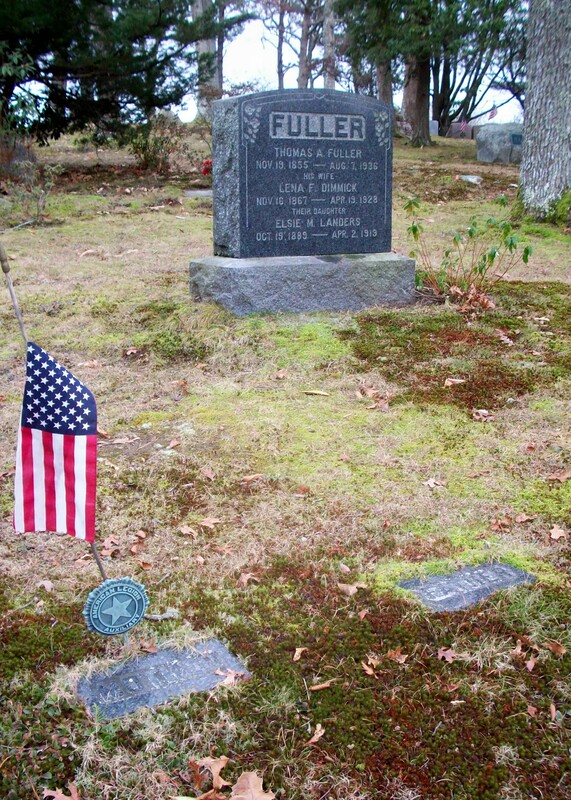 Maurice Leonard Fuller, WW l; (February 22, 1892 – November 21, 1981); Married Lillian Grinnell (1900 – 1993) (Charles H. Grinnell & Cornelia B. Davis) in Bourne Ma. on March 3, 1922; Maurice & Lillian are buried in Cataumet Cemetery. 3. Frederick Warner Fuller, WW l; (December 18, 1893 – November 1, 1984); Married Elsie May Slocum (1897 – 1994) (Arthur Howland Slocum & Adeline/Addie B. Clevesly/Cleverley) in Bourne Ma. 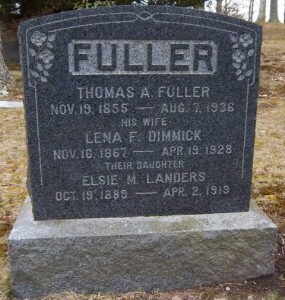 on October 10, 1922; Frederick & Elsie are buried in Cataumet Cemetery with their daughter Lois B. Fuller.